A while back I did a post about super-gluing a Mickey Mouse figurine to my middle finger. This time I have somehow gotten a ring stuck on the same finger. And I can't get it off. I put the ring on yesterday afternoon. I knew I was going to have trouble as soon as I shoved it past my knuckle. My finger is starting to get a little sore from all the tugging and possibly a little swollen, which is obviously not helping matters. Doesn't the Universe realize I can't possibly drive to work in Boston without complete and total use of this finger? It is as necessary for the commute as is a tank of gas. How will I convey my true feelings to the "left hand turn from the right lane" folks I encounter every day? I cannot be mute for my commute! Anyway, if anyone has any suggestions on how to remove the ring 1) without removing my finger and 2) while keeping the ring intact I would greatly appreciate it. Sorry hon! None of those little home remedies ever worked for me.The last time that happened to me I had to go to our local hospital emergency roon and had it cut off! You can still use that middle finger, it looks pretty swollen and it will stand out better!!!! Oh no Rubye Jean, you were the one I was counting on for a solution to this problem. I got this ring in Hawaii - it can not be cut off! Alright, gird yourself hon.. this is gonna' hurt. Apply as much washing up liquid/industial grease/any other slippery fluid that makes you think of happier times, and pop a couple of dozen strong painkillers..
Wrench that fucker with the grip of the incredible Hulk off your finger (tears notwithstanding), regardless of the inch of skin it takes with it. You want the ring, right? What's a finger? Shrug. lol shrinky, most awesome advice! i was going to suggest something like that...good luck! The only thing I've heard is dishwashing soap...I think you would be better off with the oil though. Have you gotten it off yet? 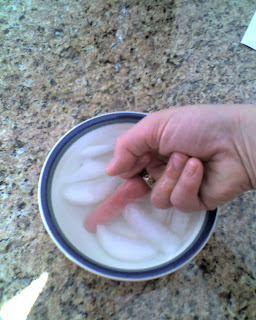 I Googled "ring stuck on finger", first ice and elevate the finger to get the swelling down. take some thread and start wrapping it around your finger starting closest to the ring. Keep the thread on you finger close together so that no skin shows through... NOT too tight, but tight enough so the skin stays under the thread...this will make your finger skinnier, temporarily...slide ring off.and take off thread! Wrap the thread or dental floss fairly tightly above the ring, tuck the end of the thread between the ring and your finger and pull the thread while sliding the ring off. It really works. A jeweler most likely can cut it off with little damage and repair it too! Shrinky I am LMAO at your comment. I love your advice but I think I am going to try Chewy's suggestion first. Your will be my back up plan. OMG, I am still laughing. Thank you Ms. Creek. I think I am going to need all the luck I can get here. Sitting outside today is not helping. Hey OC - I've tried the dishwashing soap but it didn't help. It is still on as of 2:20 PM. I have some friends who are quite handy with tools. Maybe they could just buzz it right off? But then of course I would lose the ring and that would bum me out. I am going to try your advice Chewy. Thank you so much for the link and the detailed instructions. I will give you an update as to my progess on this. Sounds like it should work. please update... that last suggestion sounded potentially painful. i would have sworn the ice water would work. You are right! You definitely need total use of that finger to drive in Boston! YIKES! No special advice from me so I have to support Chewy's comment about the string. Sounds very feasible. I have also heard that instead of string use tape to slim down your finger above the ring and then slide the ring off. But I have to say that I have seen your finger and the ring up close and I really don't think that the ring will be coming off any time soon. Sorry! um... I'm laughing at Shrinky, not your freakin' finger fiasco. No friends using power tools! I worked ER for a long time, and the first thing we would do was to wrap the finger as tightly as we could with skinny tape and then put soap on top of that and the ring would come off...sometimes. If that didn't work we used the ring cutter. If you have a pair of wire cutters and can get the tip under the ring you can cut it off yourself without a trip to the ER. If not, it's off to the ER for you dearie! Good luck! ellie told me to come look at Shrinky's answer lol@ the fucker...laughing hard here.. I would go to ER vs jeweler too as I said before and as indigo said...they know what they are doing...waiting and waiting to find out what happens! My effing finger is so fat right now that the dental floss just moved the swelling up the knuckle. I am going to wait until tomorrow to try again. Thank you for the suggestions Indigo. I think I need to drink more water or something to flush out my system. I don't think having Cheetos today helped matters. And the nachos last night were a bad idea too. Lynt and Rita - I think you both have been to Boston so you would understand about the finger thing. How about a little encourgement here Blondie? All I can think of is that scene about Windex from the movie, "My Big Fat Greek Wedding." Not that I recommend that, I'm just saying it made me think of that. Seriously, good luck with it. My advice would be the same as shrinky's. What were you thinking??? did you get the ring off? 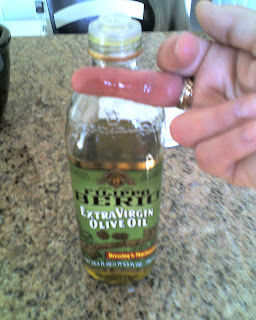 i used a pile of liquid hand soap to get a ring off my finger when i had to have hand surgery. it worked well and then the finger swelled up with the rest of the hand after the surgery and i haven't gotten the ring back on since then. If they cut the ring off it can be repaired by a good jeweler. Hope you get it off soon! That must hurt. hello? ring still on? string/tape/lubricant work its magin? ring (and finger) still in one piece??? Hey Thanks Sassy - Tried the Windex. It didn't work for me but now my finger is nice and shiney. Cristina - I am a big dummy. Hi Lilli- Thanks for the visit! Hand lotion has been the thing that worked the best. Even better than the oil. Thank you Martha. It was starting to get a little sore there.